Media captionThe folks are back on the hill again, but this time it's families playing in the snow. Very cold weather is continuing to cause travel disruption in Northern Ireland, with ice posing the main risk as temperatures fall overnight. The Met Office has a yellow warning in force for ice and snow, with fresh snow expected in southern areas of Northern Ireland late on Saturday night. Snow will spread northwards by Sunday, but not all areas will be affected. 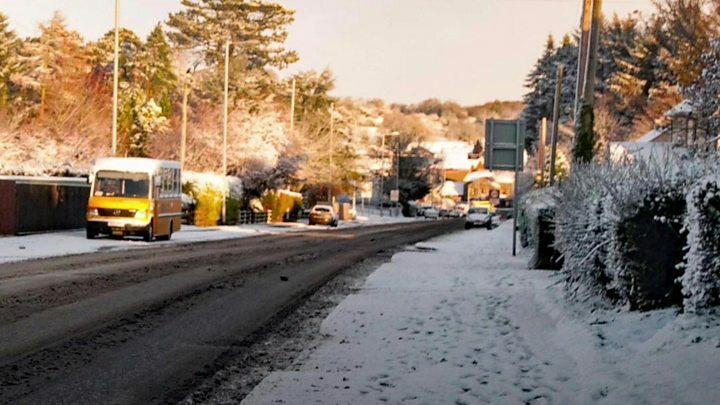 The Roads Service has finished salting the main road network but warned "hard freezing conditions" are expected. "Wintry showers are possible, particularly in coastal areas, and temperatures are to drop further later in the night," said its spokesman, Simon Wells. "The network is continuing to be monitored to ensure the salting remains effective." It urged drivers to take extra caution, especially when driving on untreated roads. There will be widespread frost overnight with minimum temperatures reaching -8°C in some places. Translink said earlier that delays could be expected on all services. Passengers travelling to and from the International, Belfast City and the City of Derry Airport have been advised to leave additional time for journeys. 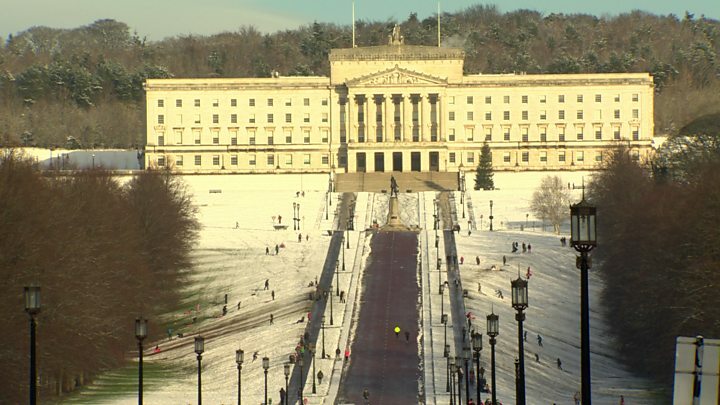 The snow brought delight for many children however, and in east Belfast, Stormont was turned into a ski slope for a second day running. Many families brought sleds to the estate to put the snow to good use. A yellow weather warning for snow and ice remains in place across Northern Ireland until Sunday. Met Éireann has issued an orange warning for snow and ice in the Republic of Ireland. It has predicted that up to 3in (8cm) of snow could fall in some areas. The worse affected places are expected to be Carlow, Kildare, Kilkenny, Laois, Longford, Wicklow, Offaly, Westmeath, Meath, Galway, Mayo, Roscommon and Tipperary. A number of Irish Premiership football matches scheduled to take place on Saturday have been postponed due to the poor weather conditions. While snow showers eased on Saturday afternoon, fresh snow is expected to fall overnight in and around greater Belfast. Some speed restrictions have been put in place on main routes. On Friday the weather conditions resulted in the closure of many schools, as well as Belfast zoo.